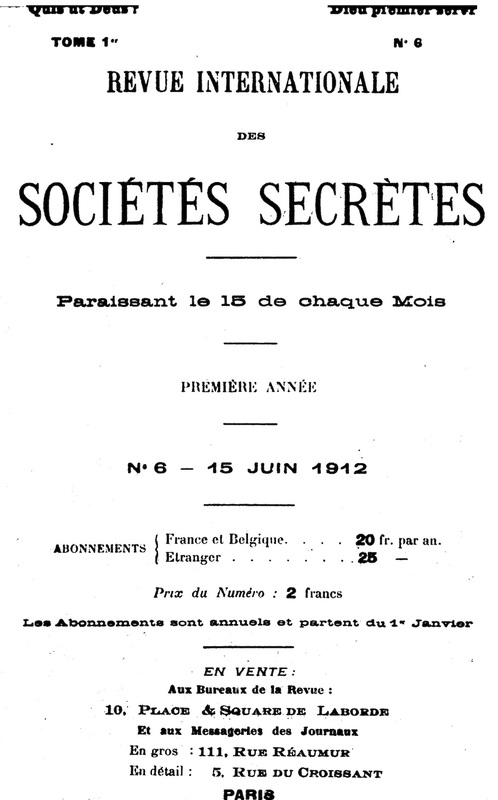 Revue Internationale des Societes Secretes, La. Paris, France. Language: French. Editor: L’Abbe Ernest Jouin; Charles Nicoullaud. 1/1, January 1912-1939. 20 francs a year, 80 pp. (varies) plus a regular multi-page "Index Documentaire" of rare documents or a "Bibliographie des Ouvrages Imprimes et Manuscrits qui ont paru sur La Franc-Maçonnerie, Les Rose-Croix, Les Templiers, Les Illumines, Les Carbonari, Les Societes Secretes, La Magie, Le Mesmerisme, etc." The journal was a clearinghouse of information on secret societies and the more obscure intricacies of eighteenth-century Masonry, and is a mine from which nuggets of obscure information are still being taken. It is also rabidly anti-Semitic, biased, hateful and credulous to a degree that is hard to believe. Monsignor Jouin (1844-1932) founded the journal to expose the material he found in a vast (30,000 volumes) library of occult and Masonic books he acquired in 1910. He featured long expositions of Jewish ritual murder, and also published the Protocols of the Elders of Zion in France in 1927. The journal discussed, citing chapter and verse from a vast erudition and bibliography, the intricacies of Freemasonry, Satanism, the Rotary Club, the Boy Scouts, Feminism, the "King of the World," the (Neo-) Gnostic Church, and the bona fides of Leo Taxil’s Diana Vaughan. It also attracted surprising contributors, such as Rene Guenon and Arthur Preuss. From 1928 to 1933 the journal devoted a regular "partie occultiste" (the "rose" section) specifically to occultism. Jouin also edited another journal, Le Peril Judaeo-Maconnique (5 volumes, 1919-1927), a production similar to Henry Ford’s The International Jew. Though the journal shared many of the interests and prejudices of La France Chretienne Antimaçonnique/La France Anti-maçonnique, the journal carried on a polemic with it over whether it was necessary to be Christian and to believe in Satanic influence in order to be properly anti-Masonic, and the journal’s editor in chief, Charles Nicoullaud (the astrologer and occultist "Fomalhaut," 1854-1925) and assistant editor Gustave Bord engaged in a long-running dispute with the "Sphinx" (Rene Guenon), who was contributing to the pages of La France Chretienne, over the nature of Masonry’s "Unknown Superiors." The journal has now been republished by Editions Delacroix in France. Dorbon 4090. Creighton University; Yale University; Brandeis University; Harvard University; Ohio State University; Stadtsbibliothek zu Berlin; Bayerische Staatsbibliothek.